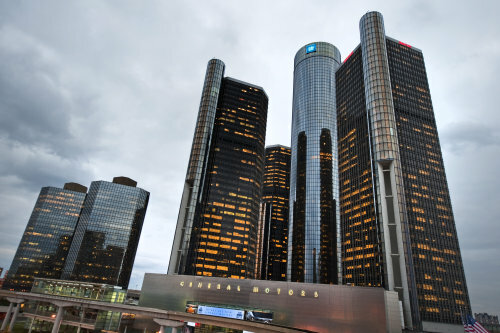 Detroit Police are investigating why an African American male rammed his early 2000s Chevrolet Monte Carlo into the front of the General Motors Renaissance Center Sunday afternoon. Eyewitnesses on local television news programs claimed that the man drove his Chevrolet Monte Carlo on to the circular driveway of the General Motors Renaissance Center, stopping in the middle of the driveway after turning the car awkwardly to face the glass front doors of the building. After a short time, the man accelerated quickly, slamming into the revolving front doors of the GM “Ren Cen”. These eyewitnesses also told multiple local Detroit news stations that the man was a African American dressed all in black but nothing else – including the man’s name, age or where he came from – is known at this point. Detroit police responded quickly and took the building-attacker into custody. Another eye witness, who is a reporter for local news source Ferndale 115, stated that she arrived shortly the incident had begun. According to Crystal Proxmire, the man driving the black Monte Carlo had tried to foolishly make a U-turn in the driveway of the Ren Cen when he accidentally hit the front glass doors. The driver of the Monte Carlo began to argue with the security guard about the amount of damage as the guard called the police. At this point, Crystal Proxmire headed in through the revolving glass doors and headed downstairs, only to come back to find the Monte Carlo jammed through the front glass doors. Evidently, when the driver was informed that the police had been called, he figured that he would make a trip to jail worth his trouble and he literally drove through the front doors. Based on the reports from independent news source Ferndale 115, we can surmise that the television eyewitnesses, who saw the Monte Carlo sitting parked perpendicular to the front doors before slamming through them, must have arrived after the initial incident had occurred. For those unfamiliar with the downtown Detroit area, the General Motors Renaissance Center is one of the tallest buildings in the Detroit city skyline – sitting just a short stretch up Jefferson Avenue from Cobo Hall that plays home to the North American International Auto Show each year. The glass front entrance area of the Renaissance Center faces Jefferson Ave with a short circular drive where cars can drive right up to the front doors to drop off visitors to the Detroit skyscraper. The front doors are not located in an area where a car should ever be pointed directly at them so there has to have been something unusual at work. Some speculate that the man damaged the building as some sort of political statement against GM or the government involvement. Some have suggested that maybe he just hates GM because he isn’t happy with his 2000 through 2005 Chevy Monte Carlo. However, if the reports that the man was initially trying to turn around when he first hit the building, perhaps the man didn’t intended to attack the Detroit building and perhaps he didn’t have any vendetta against GM - maybe he was just plain stupid. In any case, the man is in the custody of Detroit city police and should any more information become available – you can find it here on TorqueNews.com. Those were the bad years for the Monte, so it could be buyer's remorse. Now if it were an 83 - 88 fourth gen. Monte SS I would have said "lock him up and throw away the key!" Because the only car cooler than that in those sad car years was of course the Regal Grand national. Had it been a Grand National he might have made it all the way through the lobby. Those blown sixes were stout.